Today I’m going to highlight a wonderful couple I’ve had the pleasure of working with twice! Kristi contacted me way back in October 2012 to set up a photo session for her & her boyfriend, Colby, for the Marine Corps Birthday Ball. I adored working with them, as rushed as it ended up being, because they chose an unusual location for their session. They opted to drive 45 minutes from Camp Lejeune to New Bern to have their session at Tryon Palace! Their ball was in the complete opposite direction, but they wanted a gorgeous location! The gardens at Tryon Palace are absolutely beautiful, as well as historic. Here are some images from BOTH of their sessions. Kristi recently graduated from the University of Mobile with a degree in Nursing! They are currently planning their wedding and I can’t wait to see how beautiful Kristi looks in her wedding gown! Love that they’ve had multiple sessions of just them! They will love looking back on these. Stafford couples need to document their love for each other the same way! Stafford is lucky to have you as their couples photographer! These are the cutest! Great way to show their love! These are such fun engagement sessions! You did a beautiful job capturing their joy!! And Fort Macon is such a cool spot – I had no idea sessions were allowed there! Wow, just one year later and you’ve moved to Florida, she became a nurse, and he has an extra stripe! Love that you were able to do their Birthday Ball photographs again even though you were only in North Carolina for a short time. What an awesome opportunity it must have been to go back and capture one of your favorite couples even after moving! This North Carolina engagement session right before their Marine ball is just the perfect way to capture their love. For Macon was perfect against her hubby to be’s dress blues. How lucky is this couple that you were visiting at Ball time, and that you were willing to drive great distances for their couple’s sessions. That just shows that Ashley Rescott Photography goes above and beyond for her clients! 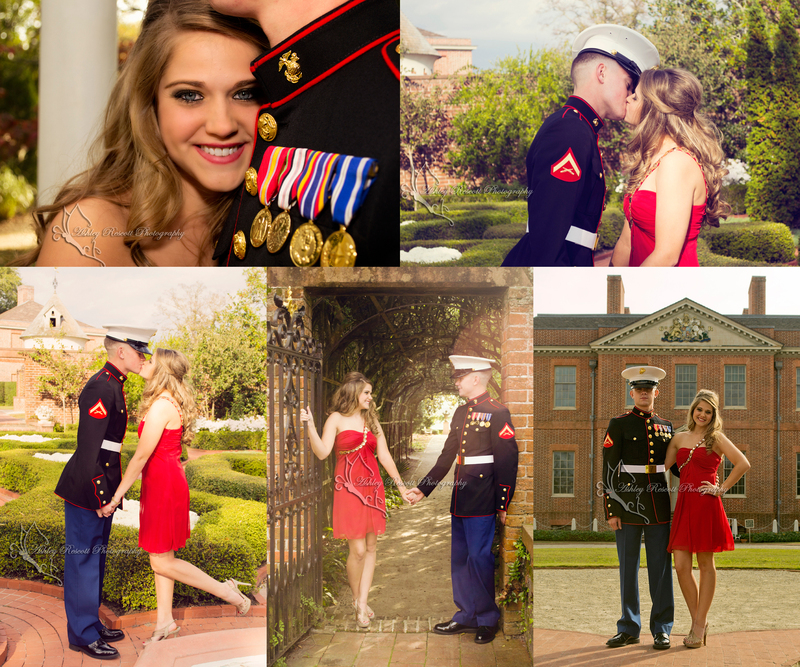 What a gorgeous set of Marine Corp Ball photo sessions! How fortunate that you were able to capture them in North Carolina two years in a row even though you are now in Florida. They should show these at their wedding, it’s so cute to see how they have grown up a bit between the two sessions. Fun to look at the two different session from their Marine Corp Ball. They are an adorable couple so I understand why you would go to fun locations with them to do portraits. Way to make the treck to photography past clients I’m sure they loved the opportunity to work with you again. Ooh! That dip in the second series of photos when he’s kissing her is my favorite! How fun that you have been able to capture this couple’s growing love for one another and be fortunate enough to photograph two Marine Corp Balls with evening attire. I know this NC couple is thankful for your drive back for their homecoming session even though you moved to Florida. That says a lot about your integrity as a professional. Love your work! Looking forward to seeing the wedding photos.